The first time I tasted a vol au vent, I was in a cosy restaurant, on Christmas Day, looking out throughout the large windows at la Place de la Bastille in Paris. Light traffic that Christmas noon, people passing bundled up against the wind, crossing the almost empty streets in quickly manners, going home. 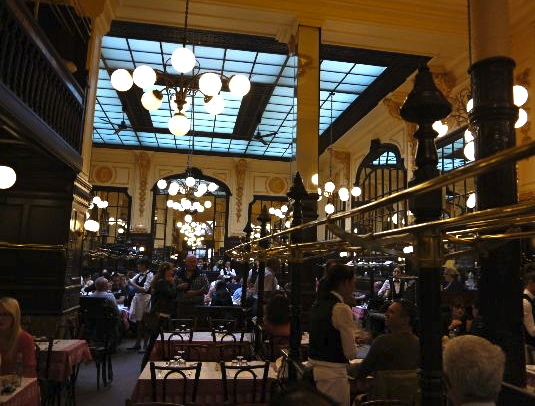 Inside, instead, a lot of diners enjoying a wonderful menu and family company for a Christmas lunch in the city of Lights! It was a warm feeling all over the red and gold decorated dining room of being together with the expectation of a gourmet meal shared in joy. I too felt like being home. Vol au vent , is a nice a word coming from the French cuisine. It has something to do with ‘ flight in the wind” or windblown’ due their lightness and it is so rightly said! These appetizers are a warm light shell filled with pleasures! Some classic puffy pastries that make a very elegant but easy starter! 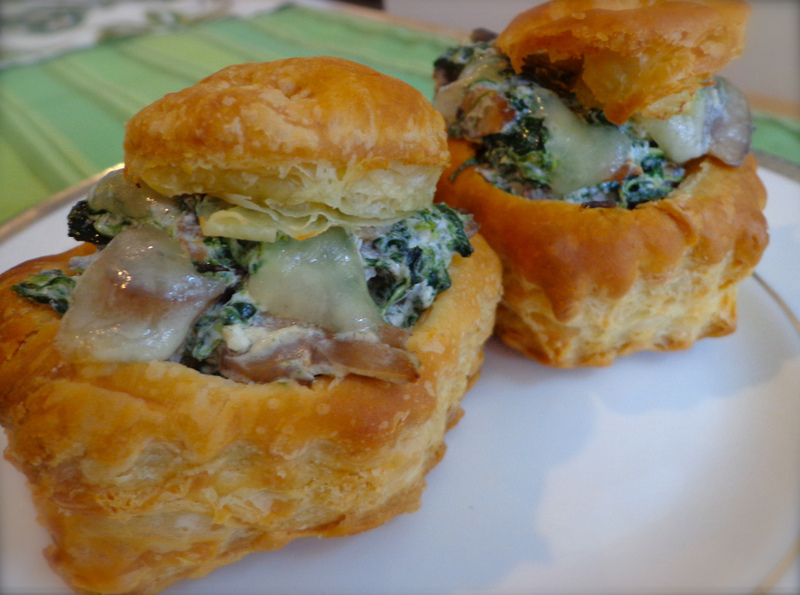 When served formally at the table, as individual appetizers, these are a wonder to eat, warm crunchy puff pastry, crumbling into a savory light filling of cheese, mushrooms and spinach. The choice of fillings is really up to your imagination. As far as the shells go, I am for everything easy and fast, so I tried the shell pastries in the frozen section from any good supermarket and it worked very well! As a first course, these savory pastries, will make a great entry to your festive table, and will allow to show to your happy and so ever grateful table guests your most creative side in putting together a fantastic Holidays menu. 1/2 glass Porto or white wine. Preheat the oven to 425 (follow carefully package directions). If using frozen pastries shells follow package directions, brushing very lightly with egg wash before any cooking only, then bake in the oven for 20 minutes. Remove the vol au vents from the oven and cool to room temperature. With a pairing knife edge remove the top of the pastry to make space for the filling. Sweat the shallots in the butter or olive oil over medium-high heat, about 2 minutes. Add the garlic and sweat until light golden brown, stirring constantly, 1 minute. Add the mushrooms to the pan, over medium heat, let the mushrooms brown before stirring once and then reduce heat and sauté, covered, till mushrooms are tender. When almost done add parsley, porto or white wine, stir, let it cook for 3 to 4 minutes more, adding salt and pepper. Remove from heat and let it cool completely. Meanwhile, boil the spinach, remove all water, if necessary dry them quickly in a skillet over medium heat for 2 minutes. Let it cool. In large bowl crumble goat cheese, adding some milk until mixture is soft, add mushrooms, spinach, paprika, nutmeg, salt and pepper.Taste to adjust the seasoning. Using a teaspoon, fill up pastry shells, going slightly over the top. Add very small slices of provolone, or gruyere, or fontina, then top the shell. Serve immediately,warm, over a bed of fresh salad with dressing!